Are these literary stunts kin to Philippe Petit’s highwire challenges—undertaken for the thrill and just to show they can be done? Park sees the “The Very Long Sentence” in more philosophical terms, as “a futile hedge against separation, an unwillingness to part from loved ones, the world, life itself.” Perhaps this is why the very long sentence seems most expressive of life at its fullest and most expansive. 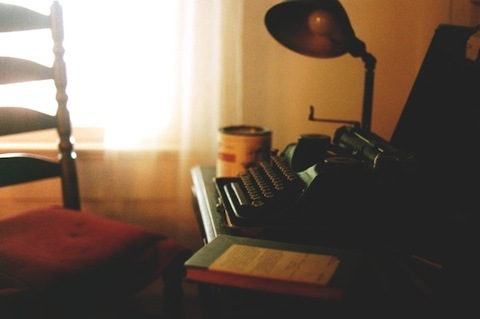 Below, we bring you five long literary sentences culled from various sources on the subject. These are, of course, not the “5 longest,” nor the “5 best,” nor any other superlative. They are simply five fine examples of The Very Long Sentence in literature. Enjoy reading and re-reading them, and please leave your favorite Very Long Sentence in the comments. The next example, from Poynter, achieves a very different effect. Instead of listing concrete objects, the sentence below from F. Scott Fitzgerald’s The Great Gatsby opens up into a series of abstract phrases. Considering how common illness is, how tremendous the spiritual change that it brings, how astonishing, when the lights of health go down, the undiscovered countries that are then disclosed, what wastes and deserts of the soul a slight attack of influenza brings to view, what precipices and lawns sprinkled with bright flowers a little rise of temperature reveals, what ancient and obdurate oaks are uprooted in us by the act of sickness, how we go down into the pit of death and feel the water of annihilation close above our heads and wake thinking to find ourselves in the presence of the angels and harpers when we have a tooth out and come to the surface in the dentist’s arm-chair and confuse his “Rinse the Mouth —- rinse the mouth” with the greeting of the Deity stooping from the floor of Heaven to welcome us – when we think of this, as we are frequently forced to think of it, it becomes strange indeed that illness has not taken its place with love and battle and jealousy among the prime themes of literature. Sentences like these, writes Barnes & Noble blogger Hanna McGrath, “demand something from the reader: patience.” That may be so, but they reward that patience with delight for those who love language too rich for the pinched limitations of workaday grammar and syntax. And Gabriel Garcia Marquez, particularly Autumn of the Patriarch. They are making us hold our breath. Semicolons seem almost cheating to me. I deduct two points for each. Great blog / Virginia Wolf. A boring academic perspective: many of these long “run-on” sentences are not at all run-one. Length alone does not a run-on make. Most sentences become run-on when independent clauses are inappropriately linked. Nuff said. More sentence written by illiterates- lauded by dumb intelligentsia. Here’s another amazingly long sentence example I found very eloquent and beautifully written. Indifferent to the truth that the members of this innocent and proscribed community can justly claim to rank as among the most disinterested, the most competent, and the most ardent lovers of their native land, contemptuous of their high sense of world citizenship which the advocates of an excessive and narrow nationalism can never hope to appreciate, such an authority refuses to grant to a Faith which extends its spiritual jurisdiction over well-nigh six hundred local communities, and which numerically outnumbers the adherents of either the Christian, the Jewish, or the Zoroastrian Faiths in that land, the necessary legal right to enforce its laws, to administer its affairs, to conduct its schools, to celebrate its festivals, to circulate its literature, to solemnize its rites, to erect its edifices, and to safeguard its endowments. Indifferent to the truth that the members of this innocent and proscribed community can justly claim to rank as among the most disinterested, the most competent, and the most ardent lovers of their native land, contemptuous of their high sense of world citizenship which the advocates of an excessive and narrow nationalism can never hope to appreciate, such an authority refuses to grant to a Faith which extends its spiritual jurisdiction over well-nigh six hundred local communities, and which numerically outnumbers the adherents of either the Christian, the Jewish, or the Zoroastrian Faiths in that land, the necessary legal right to enforce its laws, to administer its affairs, to conduct its schools, to celebrate its festivals, to circulate its literature, to solemnize its rites, to erect its edifices, and to safeguard its endowments, But then they were married (she felt awful about being pregnant before but Harry had been talking about marriage for a while and anyway laughed when she told him in early February about missing her period and said Great she was terribly frightened and he said Great and lifted her put his arms around under her bottom and lifted her like you would a child he could be so wonderful when you didn’t expect it in a way it seemed important that you didn’t expect it there was so much nice in him she couldn’t explain to anybody she had been so frightened about being pregnant and he made her be proud) they were married after her missing her second period in March and she was still little clumsy dark-complected Janice Springer and her husband was a conceited lunk who wasn’t good for anything in the world Daddy said and the feeling of being alone would melt a little with a little drink—I milked the cows, I churned the butter, I stored the cheese, I baked the bread, I brewed the tea, I washed the clothes, I dressed the children; the cat meowed, the dog barked, the horse neighed, the mouse squeaked, the fly buzzed, the goldfish living in a bowl stretched its jaws; the door banged shut, the stairs creaked, the fridge hummed, the curtains billowed up, the pot boiled, the gas hissed through the stove, the tree branches heavy with snow crashed against the roof; my heart beat loudly thud! thud!, tiny beads of water grew folds, I shed my skin. a very long sentence could be the most in one area,that has been running now it great,when I thought this famous sence.